A versatile seasoning to boost the meatiness in many dish applications, without the use of MSG. Maltodextrin, Salt, Sugar, Corn flour, Chicken Meat And Fat, Permitted Flavouring (Contains Egg), Hydrolyzed Vegetable Protein, Spices, Sodium Inosinate And Guanylate, Soy Sauce (Contains Wheat) And Celery. For Stir-Frying Marinating and Seasoning: Sprinkle desired amount of Knorr Chicken Seasoning Powder - No Added MSG to improve the taste of foods. 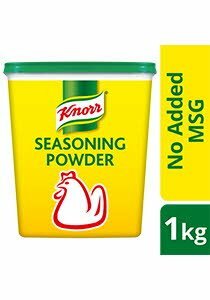 For stock: dissolve 20g (2 heaped tablespoons) of Knorr Chicken Seasoning Powder - No Added MSG in 1 litre of boiling water. Made with good quality chicken meat.